Notes from the Trail: Climbing Kilimanjaro, Day Seven, Summit Day! With a cup of tea and few biscuits in our belly, headlamps on and dressed in full winter gear (snowpants, down parka, hats, gloves, handwarmers, and layers below), we began the gruelling seven-hour ascent of Kibo Peak at 12:15 am. Marching single-file behind our guide Rashid kama kinyonga (chameleon-style), we slowly ascended the 1100 vertical meters to Stella Point. Our difficulties in the endurance test of physical and mental will power included: freezing toes and fingers, uncontrollable “crop dusting*” and frequent “downloading*,” relentless snot-dripping, the hypnotic delirium of staring for hours at the feet of the person walking in front of you, mistaking stars for headlamps further up the trail, and dealing with the slowed reactions that naturally come with hiking at extreme altitudes. Finally, as the sky began to turn light and the glacial ridges of Kili came into view, we reached Stella Point just as the sun first crested the horizon, much to our joy and relief. The final push to Uhuru Point was the most exhausting and yet most exhilarating stretch of the trail, and this final leg seemed as if it would never end. 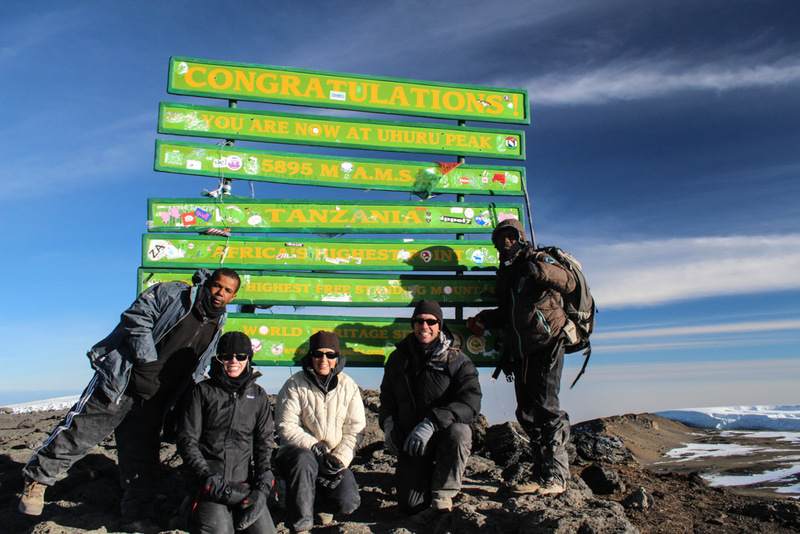 At long last we reached the 5895 meter peak…(“58-95, that’s our number!” pace Toots & the Maytals). We recorded our achievement with the requisite “we made it” photo at the sign marking the summit and slowly made our way back toward Stella Point passing weary hikers still struggling to reach the top. We marveled at the views as we gazed down at glaciers that floated above a blanket of clouds glistening in the sun. The scene was truly overwhelming. We paused for tea and energy bars back at Stella Point before beginning the long descent down a soft sand slope, “skiing” the whole way. Despite the exhaustion we were all in a buoyant mood. Here’s our account of making it to the summit. Please forgive the sound quality—it is super windy at 19,000+ feet. Four hours later we were greeted back at Base Camp by our crew with high fives, fist bumps and big smiles. After a quick nap and a warm lunch we resumed the descent. Leah was suffering from an intense headache which gradually improved as the trail steadily dropped in elevation. Three hours later we reached Mweke Camp just as the sun went down. Barely able to keep our eyes open through dinner, we collapsed into our sleeping bags for a peaceful slumber at this lower altitude—only a mere 10,000 feet. What a day it had been! From midnight to sundown we had ascended 4000+ feet to Uhuru Peak and then descended over 9000 feet—almost two miles straight down—to reach our final camp on the mountain. We all felt an incredible sense of accomplishment to have successfully reached the summit of Mt. Kilimanjaro, especially after seeing so many fellow trekkers on the trail suffering, some with debilitating headaches and nausea, others with the blue lips of hypoxia. Still others had to be physically supported up and down the mountain by their guides. 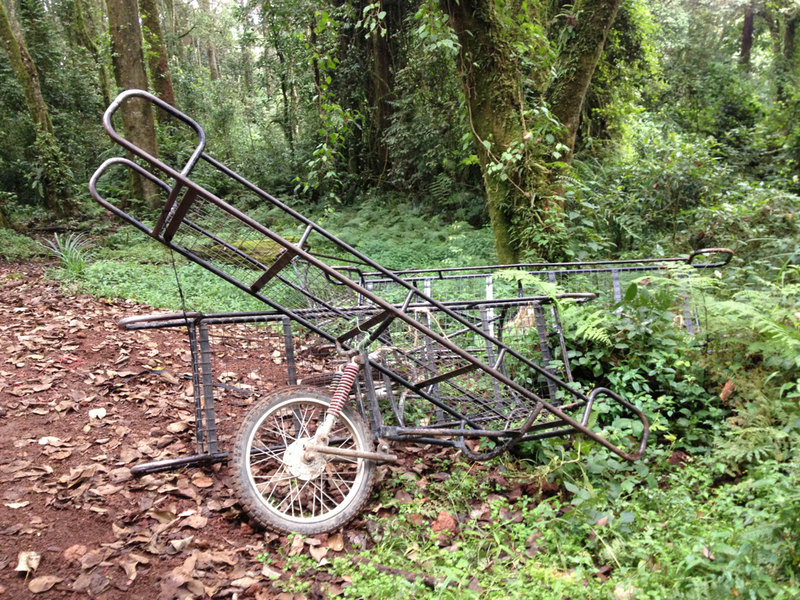 We saw one poor girl who had strained her Achilles’ tendon and was being carted down to Mweke Camp, strapped to a bouncing, one-wheeled stretcher with her guides and porters struggling to keep the medieval-looking contraption under control. It would be hard to imagine a more uncomfortable ride! As we slipped into our well-deserved deep sleep, we were relieved to have the challenging day behind us, and we felt utterly thankful to have made it down safe and sound. Congratulations!! Definitely not an easy feat and yet you still managed to get some great photo and video shots along the way and a little dance at the top!! and all this after Meru… very impressive! Congratulations and thank for sharing! Come climb in SW Colorado! Would love to see you two again…. We hope to get out to CO in the not-too-distant future. What a beautiful state you live in. Thanks for reading! Way to go! That was quite an adventure. It is always nice to make your goal. I am really impressed by your determination to reach the top. Congratulations! Thank you, Andy. Getting to the top was incredibly difficult, and we felt very fortunate that all of us made it. It must have been all those steps we did at the toboggan run back in the suburbs of Chicago! Congrats!!!! Sounds like all the pre-trip training really paid off!!! What an amazing adventure!! Thank you! We are planning on heading to Ladakh, India next summer and did our first training session back at Mt. Trashmore yesterday. Hopefully it will do the trick again! Incredible! I really hope to do this someday! We hope you get to, too. It really is a fantastic experience–exhausting, challenging and rewarding–all at the same time. Thank you for following and taking the time to comment. We really appreciate it! Grazie, Ven, ma il piacere è nostro. Molto grazie a lei per leggere. Speriamo che lei va a Kilimanjaro presto. È un posto meraviglioso. Ciao! Wonderful content. Congratz on making it to the top. I wanted to ask you if you had any issues with your camera in low temperature? Did u bring a lot of batteries with you to shoot video in high altitude? After your experience, do you still recommend bringing a heavy DSLR? Thanks for your comment, John. Is it worth it to carry a heavy DSLR on any long hike is a question we struggle with all the time. In fact, this summer we just started carrying a small point and shoot (in addition to our DSLR) on three different 12-day hikes, and we are eager to see how the two cameras compare. Once we get a chance to load them on the computer and compare the outcome, our answer to this question might change! For Kili, we were really worried about the weight of the camera given the extreme altitude and ultimately decided to take a Canon Rebel (much lighter than our preferred 7D) and a small video camera. Since we were only carrying a daypack, it was worth it to us to have a better quality camera than a point and shoot, and there was definitely lots of time for photography. We were happy to have it. Climbing Kili was a once-in-a-lifetime experience for us, so we wanted the best pics we possibly could. I think we used 2 batteries for our 8 day trek, but we were only using a short lens which doesn’t use up the batteries too quickly. We did sleep with the spare batteries in our sleeping bags on summit night and kept them in our interior pockets for the summit hike itself. We probably only used a battery or two on the video camera as well, but we didn’t shoot as much video as we thought we would. If you plan on shooting video with your DSLR, you’ll probably need more batteries for that camera. Hope that helps. Let us know if you have any more questions. Have a great hike!! !